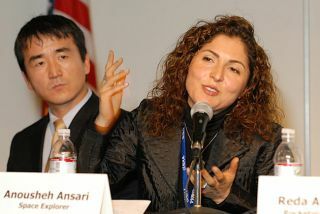 Private space traveler Anousheh Ansari recounts her orbital flight and life aboard the International Space Station. LAS CRUCES, N.M. – Off-planet travel is an experience like no other, saythose that have already travelled into orbit. And that's just what ticketed,still-to-fly customers for future suborbital treks want to hear. Space travelers – those that haveflown, as well as patrons-in-waiting for commercial spaceline operations tobegin – spoke at the 2007 International Symposium for Personal Spaceflight (ISPS),held here October 24-25. Reda Anderson, the first customer tosign up for a suborbital sendoff courtesy of Rocketplane Global, Inc., listedthe "three R's" of commercial personal spaceflight: Risk, Reward, andResponsibility. Anderson doesn't see herself as a tourist. "That's because they are notserving coffee on this flight. I see myself as a pioneer ? one of, say, thefirst 100 people that certainly are pioneers, maybe the first 500," shesaid. "We are the ones who'll beginthis movement," Anderson added. "Darn right I know I could die there." For Craig Willan, a future passengeron Sir Richard Branson's Virgin Galactic suborbitalspaceliner: "I'm not worthy to be called an astronaut or an astronautcandidate. I'm a space traveler ? that's basically it." His official jobhere on Earth is President of Omega Research and Engineering, Inc. of Justin, Texas. Like Anderson, Willan also said thathe readily accepts the risks associated with public space travel. As for the current price tag to flyaboard the suborbital SpaceShipTwo, now being built for Virgin Galactic, Willan'sseat into space is costing $200,000. He'll be one of the first 100 to ride thatvessel and believes that, potentially, ticket prices are going to come down – way,way down in the future. Earlier in the day, Alex Tai, ChiefOperation Officer for Virgin Galactic, noted that the company now has $31million in deposits from future suborbital space travelers. "When we startflying people from Spaceport America here, and we show people exactly howwonderful it is to go to space and the wonderful experience you can have ? themarket is really going to open up," he said. There are two things you'll rememberabout being in space, explained Michael Lopez-Alegria, a veteran NASA spaceflyerwith 10 spacewalks to his credit, as well as a stint aboard the InternationalSpace Station. "The first is that it's betterthan you ever imagined. And the second is that you can't go back in your mind ?it's like a dream, like a parallel existence that you just can't get your armsaround," Lopez-Alegria said. He said that once you've lived in space, theexperience you'd like to bottle up so you can take a sniff of it every once ina while. "Space is very addicting ? sobe ready for that," Lopez-Alegria suggested to the audience. Launch andthe speed needed to reach Earth orbit are truly amazing events, he said. The sensation of floating – whetheryou equate that to a fish or a bird – "it doesn't matter. The sensation isunbelievable ? and the amazing thing is that it just never stops,"Lopez-Alegria said. In viewing the Earth from space,Lopez-Alegria said that our planet takes on many faces. "It looks fragile.It looks sturdy. It looks inviting. It looks hostile," he suggested. From a spacewalker's perspective,with the freedom of looking at the sky during a night part of an orbit aroundthe Earth, Lopez-Alegria pointed out: "Instead of seeing a black sky withpinpoints of light, it's almost as if you see a white sky with pinpoints ofblack. That's how many stars there are," he said. A little over a year ago, AnoushehAnsari, attracted worldwide notice as the first female private spaceexplorer to board the International Space Station. The high-tech businesswomanand co-founder of Prodea Systems of Plano, Texas paid some $20 million for herorbital adventure in September 2006. The actual experience "exceedsall expectations" and is something that's hard to put to words, Ansariadvised. "A lot of people say that diving is the closest thing to beingweightless. It comes close, but still, it's not the same." Ansari's suggestion, for thosetaking suborbital flights of short duration, is that future travelers need tomake the whole journey the experience – and not just focus on the moment ofweightlessness or the moment you see Earth. The entire preparation and mentalpreparedness is part of the journey, she said. "There are a lot of newsensations that you'll be introduced to, and you need to mentally be preparedfor that," Ansari said. In her mission into Earth orbit,being able to observe the Earth from space had an impact on her. "It sortof reduces things to a size that you think everything is manageable. All thesethings that may seem big and impossible ? we can do this. Peace on Earth – noproblem. It gives people that type of energy ? that type of power, and I haveexperienced that." Retired NASA astronaut, Dan Barry,has a trio of spaceflights under his flight helmet. His take home messageregarding the importance of taking risk in order to fly through space boileddown to one word: adaptation. "Life is something thatmodifies its environment ? changes things around in order to succeed,"Barry explained. The obvious adaptation of the human race to all of the issuesthat are confronting us on the planet is to leave – to develop a spacefaringsociety, he said. Mars is Barry's object of choice inregards to human expansion outward, on the drive to eventually become astellar-traveling species. "It is more than just nice. It'san obligation for us to get off this planet – to make it no longer possible towipe out the species with a single event, an asteroid, or a crazy virus or anecological runaway," Barry said. "It becomes not a destiny, but an absolutenecessity for us to establish a place on Mars that is permanent, independent ? andcapable of sustaining the species without Earth."